The HSU Department of Music presents a special duo piano recital featuring HSU Director of Keyboard Studies Daniela Mineva and HSU Alumnus Ryan MacEvoy McCullough on Friday, March 29 at 7:30 p.m. in Fulkerson Recital Hall. This will be a rare opportunity to hear the monumental work “Vision de l’Amen,” a suite of seven pieces for two pianos by French composer Olivier Messiaen, presented for the first time ever in Humboldt County. Both Mineva and MacEvoy McCullough share a love for the music of Messiaen. Pianist Ryan MacEvoy McCulloughPianist MacEvoy McCullough has developed a unique career as soloist and collaborator, at home with music ranging from the standard repertoire to electroacoustic improvisation. He has appeared as concerto soloist with major orchestras, including the Toronto Symphony Orchestra and Los Angeles Philharmonic, and has performed with the Mark Morris Dance Group and contemporary ensemble eighth blackbird. 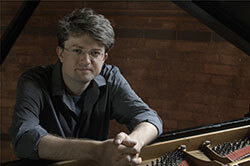 He has performed at the Tanglewood Music Center, Token Creek Chamber Music Festival, Sarasota Festival, Methow Valley Chamber Music Festival, and Nohant International Chopin Festival, and in March of 2015 co-directed Environs Messiaen, a festival at Cornell University celebrating the naturalist aesthetic of Messiaen. “Going to HSU was probably the most important thing that happened to me in my musical life, because despite the size of the department and its relative isolation geographically, I was given an education that I have subsequently realized vastly outclasses the education I’ve received at ‘more prestigious’ institutions,” MacEvoy McCullough says. Interested in new music from an early age, MacEvoy McCullough has worked closely with many renowned composers, and has commissioned or been dedicatee of works by John Harbison, James Primosch, Carter Pann, John Liberatore, Jenny Beck, and Dante De Silva. Active as a recording artist of new works, MacEvoy McCullough’s growing discography includes a 2008 album of solo piano music by 20th century Polish-French composer Miłosz Magin on Acte Prealable, a 2013 Innova Records release of Andrew McPherson’s Secrets of Antikythera for magnetic resonator piano, and 2018 releases of solo piano music by John Liberatore (Albany), Nicholas Vines (Hipster Zombies from Mars, Navona), and piano and vocal works by John Harbison and James Primosch (Albany). MacEvoy McCullough holds his B.A. from Humboldt State University and M.Mus. from the University of Southern California, as well an Artist Diplomas from the Colburn Conservatory and The Glenn Gould School. He has studied primarily with Deborah Clasquin, David Louie, and John Perry, in addition to influential work with Stephen Drury, Leon Fleisher, and Xak Bjerken. He is a doctoral candidate in Keyboard Studies at Cornell University, as well as visiting lecturer in piano. Visit MacEvoy McCullough’s website for more information. Pianist Daniela MinevaHailed by critics as a “vibrant and expressive performer who could steal the show in every concert” (New York Times) and “energetic and lively pianist who displaces power and delicacy in nuanced sensitivity along with virtuoso technique” (The Baltimore Sun), Mineva has a unique approach to standard repertory, combined with the performance and dedication of works by living composers that has taken her career throughout Europe, Asia, North, and South America. Mineva has been the winner and finalist in numerous international and national competitions including the 2007 Jean Francaix piano competition in Paris, France, 1998 Steinway International Piano Competition, the International Competition “Music and the Earth” in Sofia, Bulgaria, and many others. During the Piano Meeting Festival 2007 in San Danielle, Italy, she was awarded with the prize “Highest Artistic Level of Performance” for her solo recital at the festival. Mineva maintains an active performing career. She has appeared as orchestral soloist, chamber music collaborator, and solo artist at some of the most prestigious venues in Bulgaria, USA, China, Italy, France, Greece, Russia, Germany, Thailand, and Costa Rica. A strong proponent of new music, Mineva has collaborated with many young and established composers as well as new music ensembles like Speculum Musica, Earplay, OSSIA, Eastman School of Music, and Twenty One. Since 2011 she has served as the president of the International Society for Pianists and Composers in the United States. Mineva has commissioned and premiered works by many young and well-established composers like Libby Laresen, Chen Yi, Bright Sheng, Frederic Rzewski, Julia Wolf, Krassimir Taskov, Vera Ivanova, and Carlos Sanchez Gutierrez. Her first CD “Volume One” presents Mineva’s passion for the music of our time and its connection to the past masters. In 2013, the Society of Composers on the Capstone Records also featured her recording. Some of her performances have been heard on WXXI 91.5, Bulgarian National Radio, TV-Chanal 1, TV-SAT, Bulgaria, and Radio France Musique. As an accomplished and versatile chamber musician, Mineva has participated in many music festivals and summer programs, including Tanglewood Music Festival, Institute for Contemporary Music, and San Danielle Piano Meeting. Mineva’s passion for chamber music led to organizing the concert series “HSU Chamber Music Concert Series at Morris Graves Museum” in Eureka and “New Horizons Festival” at Humboldt State University. Highlights of the season 2018-19 include concert tours in Asia and Europe with program by C. Debussy and O. Messiaen. Previously, Mineva taught at Eastman School of Music, where in 2007 she was awarded “TA excellence of teaching” and Concordia University- Chicago. From 2013-2018, she was appointed as the Artistic and Executive Director of the Sequoia Chamber Music Workshop. 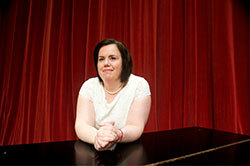 She is also Co-director of the North Coast Piano Festival and Competition where she serves on the faculty as well. Born in Bulgaria, Mineva began piano lessons at the age of five with her mother as her first teacher. She graduated from Sofia Music Academy with a Bachelor of Music and a Master of Music in Piano Performance and Choral Conducting. Mineva also holds a Master of Music in Piano Performance and the Outstanding Graduate Diploma from the University of North Texas as well as Artist Certificate from Northwestern University and Doctor of Music Arts degree, and the Performer’s Certificate from the Eastman School of Music. Her principal teachers include Natalya Antonova, Ursula Oppens, Pamela Mia Paul, Geni Zacharieva, and Julia Girginova. She has also worked closely with Emmanuel Ax, Pamela Frank, Paul Bodura-Scoda, Vladimir Tropp, Joseph Kalichstein, and Sherrill Milnes. The performance takes place Friday, March 29 at 7:30 p.m. in Fulkerson Recital Hall. Tickets are $15 general, $5 child, $5 for HSU students with ID. Call 707.826.3928 or visit the Center Arts website for tickets.